Have I got a treat for you folks! 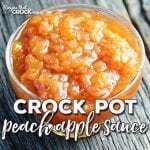 This Crock Pot Peach Apple Sauce is super easy to make and will have everyone asking for more! I wasn't sure if I was going to need a 4-quart or 6-quart slow cooker, so I pulled out my multi-quart. It definitely needed to be on the 6-quart setting. I love that I have the options of 2, 4 or 6 quarts on this slow cooker. If you are in the market, I highly recommend it. This is a flavorful apple sauce without the brown sugar, but the brown sugar makes it a sweeter peach apple sauce. If your peaches are already sweet and not tangy, then you might not need brown sugar at all. If you like your apple sauce chunky, use a potato masher. If you like it super smooth, use a blender. If you like it in between, use a mixer. I have tried it all three ways, and it awesome however you mash it up!